I was reading on FB someone posted this scripture, well, only verse 6, and wanted to see what it was in context. Sure it is comforting to know God is just and God will payback those who trouble us, BUT what if that person or persons come to have a saving relationship with the God of all? What happens to that person? How are you gonna feel is the just God forgives the person, saves them and gives them a seat in heaven? 5 All this is evidence that God’s judgment is right, and as a result you will be counted worthy of the kingdom of God, for which you are suffering. 7 and give relief to you who are troubled, and to us as well. This will happen when the Lord Jesus is revealed from heaven in blazing fire with his powerful angels. 8 He will punish those who do not know God and do not obey the gospel of our Lord Jesus. 10 on the day he comes to be glorified in his holy people and to be marveled at among all those who have believed. This includes you, because you believed our testimony to you. Paul is discussing man of lawlessness, standing firm, requesting prayer, warning against idleness, 2 thess 1-3. So Jesus will pay them back when He comes back and not a minute sooner. We are to wait on His time. See verse 8? Who is He going to punish? Those who do not know Him or obey His gospel. Pretty compelling? So, say someone really really hates me because I troubled them in high school. So I should get paid back by God because God is Just. But I came to saving faith through Jesus, now I obey Him and love Him. So what justice wins out, the payback justice or the saving faith promise to forgive sinners? You are Beautiful In His Eyes~! Here is where you will find all the negative comments. “What If Jesus Became a Tattoo Artist? ” He’d be sinning, which is impossible for God and would defeat the purpose of salvation, holiness, etc if it were possible. blasphemy!!! !The Lord will not disobey his own word..have you come so low in your humanity that the God of heaven..the creator of all will come down and do such filthy work..No you have all gone mad and think that you can do whatever you have in your puny minds how you think God is..You all have lost the concept of who God is….God have mercy on you!! Wow, how close minded can you guys be. I’m glad I serve a God who doesn’t think like you all do. My Jesus tattoos and enjoys spending time with me. We wonder why people won’t step foot in our churches when we have such a hard time thinking outside the box. So much for loving everyone for who they are or what they came from. What If Jesus Became a Tattoo Artist?… I am unliking this page and their hidden agenda, that way I am closer to Jesus who minds you would have never been a Tattoo artist. Perhaps He is a “tattoo artist”…Isaiah 49:16 says: “See, I have engraved you on the palms of my hands; your walls are ever before me.” Sounds like some sort of inscription He has placed on His own hands. We might refer to it as a tattoo. Jesus worked as a _carpenter_ until he was around 30 years old. He might have worked on making fishing boats as well, or cabinets and lockers for them, since the Sea of Galilee was nearby. Why can’t film-makers simply accept and depict the Biblical record? What if, Jesus came back/was as/ lived as a tattoo artist? PEOPLE! Jesus was a carpenter and the son of God. He came once to be a servant and take away our sins and he will come back, once, to bring His flock in, to be a warrior, judge, executioner, KING!!! Read your scripture! PEOPLE! have you not read your bible or know anything about writing styles? this is a metaphor. For the sins HE took away from you! I got chills when he took his shirt off at the end. Who are all these people to say what Jesus would be? argh. And the people who are bitching about tattoos have their ears pierced. Anywho, watch the video and give me a comment. I likes comments. This book was amazing. Really. 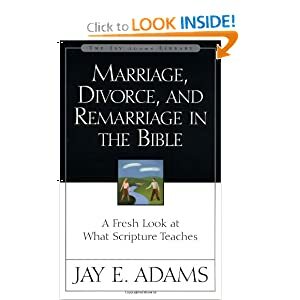 It set me straight on a few things and made it clear to me what God desired of marriage, what Jesus said and meant about divorce and when someone can remarry. My husband was married before [I have not been], so I immediately skipped to the divorce section. I thought God thought one was always married to their first wife in His eyes. Wrong. Basically this is what I got out of the divorce section: Ya can’t get divorced unless someone is unfaithful and then it’s not mandatory, reconciliation is better. If there is no infidelity then the one who wants the divorce and will not repent and work on marriage, gets schooled, I mean counseled and if still unrepentant then they are to be considered an unbeliever and excommunicated. Then if the non-believer does not want to stay in the marriage, the christian is free to divorce with no penalty. Sound complicated? If you are a christian and long to know what God desires of your relationship with your spouse, READ THIS! !